In addition to creating new lamp shades we offer a full repair service. If your lamp shade has sentimental value, but after many years is looking a bit worse for wear, we will either strip and re-cover it or re-make it as new. If you have recently re-decorated and the lamp shade colour no longer suits the room, we will re-cover or re-make it for you in a colour to suit. 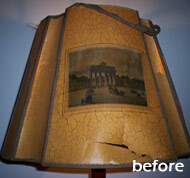 If your lamp shade has a tear, split seams or the lining is deteriorating, we will repair it for you, where practical. 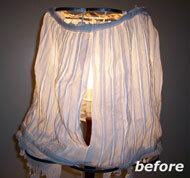 If the trim on your lamp shade has come away and is swinging in the breeze, we will re-attach it for you. 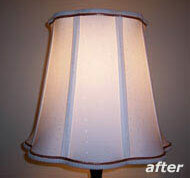 If your lamp base is broken or damaged and the lamp shade no longer sits properly, we will repair the base for you. 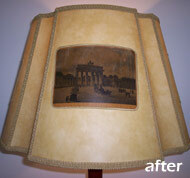 If your lamp shade is dirty from years of being on display, subject to the type of shade we will clean it for you. If your lamp shade is split or cracked and the wire bits are broken or falling out, we will repair it for you, where practical. Having said all of that, sometimes it can be more cost effective for us to re-make a shade rather than repair it. Give us a call to arrange a free consultation at our sewing rooms to have your shade evaluated. Or email us with a picture if you can't visit us. We maintain that no job is too small.